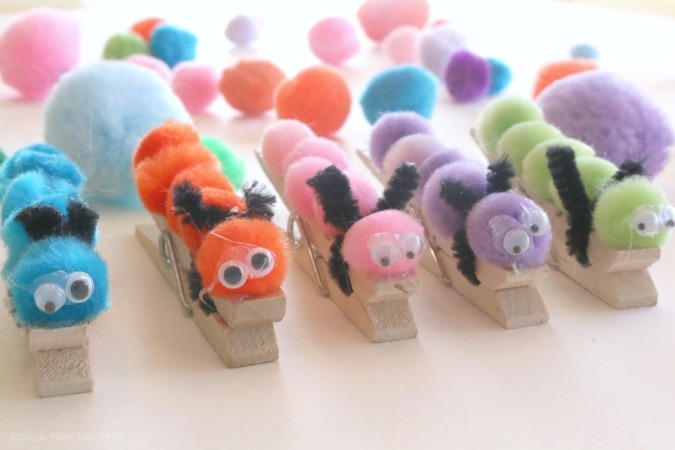 Make some adorable pom pom caterpillars to use for this FUN clothespin game! Little ones can be involved through the whole process and will delight in putting their color caterpillars by playing a game I've affectionately named, Hungry (Hungry) Caterpillar. This clothespin game is a playful way to sneak in fine motor skills and can be used to reinforce colors and other math skills, too. Enjoy this clever way to learn and play today! I know I sound like a broken record when it comes to this subject, but especially in the digital age we are in, the development of fine motor skills amongst our littles is so so important. The coordination, strength, dexterity of the fingers and hand are important for many skills later in your child's development-- especially writing! Today, our Hungry Caterpillar Clothespin Game builds on those important fine motor skills and can be used to reinforce colors and other math skills. Or forget the skills, it is just plain FUN!! This game reminds me of the game, Hungry Hungry Hippos, but without the obnoxious clacking noise! Try it! Have fun! First, you will need to prep your pom pom caterpillars. Since these pom pom caterpillars are assembled with hot glue, please be watchful of little hands! Adult supervision encouraged. 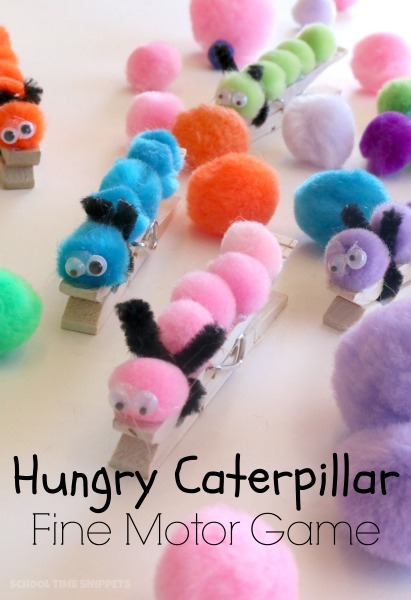 Each player will need a caterpillar, so grab that one clothespin for each player. And maybe a few extra, because they are too cute! 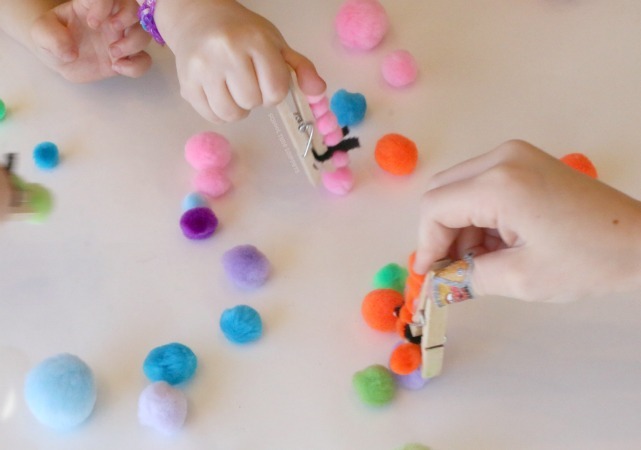 Hot glue five mini colored pom poms on each clothespin-- one color per clothespin. So one pom pom caterpillar might be all pink, one green, one blue, etc! Twist a piece of black pipe cleaner around the upper opening of the clothespin-- cut off the excess to use for the next antennae. Hot glue two googly eyes on each pom pom caterpillar. Make sure everything is glued on, and your are ready to play! 1. Have each player collect the same colored pom poms as his/her caterpillar. 2. Have each player grab as many pom poms with their clothespin caterpillar; whoever grabs the most wins. 3. Add a die, and grab that many pom poms to add in some counting skills and number recognition. Whoever has the most pom poms, wins! Or, make up your own game using our Hungry Caterpillars! However, the point is to work on those fine motor skills, so encourage your child to work on his/her pincer grasp with our colorful pom pom clothespin caterpillars any way they choose! 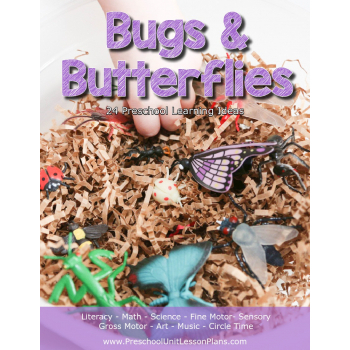 “Build, measure, paint and read all about bugs and butterflies!” with this collection of 24 literature based preschool lesson plans.